Your favorite animal will be the toast of the town on these pewter-base, cork bottle stoppers, designed to fit any standard bottle. The hippo atop is cast of durable stone resin and can take any amount of wine splashes you care to deal out. Ideal for gift giving! 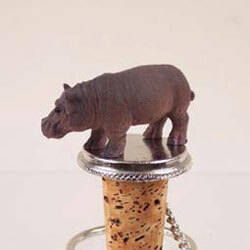 Hippo wine stopper measures about 3" to 3 1/2".